Today on History Undressed, I'd like to introduce you to our guest author Kate Dolan, who also happens to be a historical reenactor. I can not think of a more fun hobby! My packing list includes a basketful of petticoats and a sugar axe—not what most people typically bring when they go camping, but this is not a typical camping trip. I’m headed to the Ft. Frederick Market Fair, an event which evokes the atmosphere of an 18th Century colonial village. I’m a reenactor without a gun. We’re not attempting to recreate a past battle or specific historical event. Rather we’re trying to recreate, as much as possible, a bit of everyday life in the 18th Century. This includes cooking over an open fire, sleeping in shelters or barracks that were used during the time period, and avoiding modern conveniences as much as possible. And we do it all wearing 18th Century clothing, which isn’t that big of a problem unless you have to get somewhere in a hurry. My family and I only camp at a couple of such events each year, so I’m not the most experienced “primitive” camper on the block, but we’ve been doing this for eight or nine years so I generally know what to expect at an event. I know that if we’re cooking, we’ll need a lot of firewood. And that means I’ll need someone to collect it, replenish the supply, and most importantly, to split the big hunks into small chunks about the size of a small box of spaghetti. Those small chunks start to burn quickly and help keep a fire at an even temperature. This is really important when cooking things like pancakes and bacon. (The pancake recipe is period-correct; the modern bacon really isn’t but we like it too much to leave it off the menu!) By contrast, baking something like an apple pie requires a big, long-burning fire that produces lots of red-hot coals. Then even after cooking, you need to keep the fire going to heat water to wash the dishes. Over the course of a day, it’s a lot of wood. The registration fee at most events includes firewood, and there’s usually enough for everyone, but there’s no guarantee that it’s dry or that it will stay that way, so some people will start to hoard wood as soon as they set up camp. Sometimes roving gangs of oversized children go around trying to sell firewood, but we try to steer them to more honorable pursuits like stealing laundry (more about that later). So did I notice my hair smelling like vinegar? Well, no, because it smelled too much like smoke to notice any other smell. Words cannot really describe how pervasive the smell of wood smoke is after a day of living right by the fire. Wool clothing in particular absorbs the scent like a sponge, but it seeps into everything. I imagine back in the colonial era that was quite a blessing, as the smoke could cover up a great many less pleasant aromas. But it can be quite a shock when we return home and bring things in the house. Sometimes we turn right back around and leave them outside again for a few days to air out. Most of my colonial wardrobe doesn’t get washed much, if at all. My basic undergarment, a shift, is like a thin white nightgown and those do get washed. Over that I wear a pair of stays (like pants, this pair is actually just one garment). They lace up around my ribcage and force me to sit without slouching. If I lace them tightly, they can make it difficult to take in a deep breath, but usually if I’m working I don’t make them tight so they’re fairly comfortable. Stays are similar to a corset, but they’re shaped differently and don’t come down as far so they don’t cinch in the waist as much. Over the stays, I wear two petticoats, which are not undergarments but outer skirts. Sometimes they are worn under a gown, but they are meant to show and be pretty full. Women who are trying to dress in a more fashionable manner will make their skirts even more bulky with padding (bum rolls) or cage-like devices called panniers. Not me. I find using the porta-potty challenging enough with two simple petticoats. Anyway, back to getting dressed because it does take about twenty times longer than it does on a regular camping trip. Over the shift, stays, and petticoats I wear a short gown or or jacket of some kind. That is held together with pins and tied closed with an apron. I use the apron as if it were a giant paper towel, so it’s pretty dirty by the end of the day. Unless it’s really hot, I wear period stockings that come up past my knees and shoes like loafers with about a two-inch heel. If I’m lazy, I’ll wear modern clogs. If I’m trying to be more authentic, I’ll put on (briefly) a pair of straight-lasted reproduction colonial leather shoes. Apparently, the 18th Century fashion for symmetry even carried over to footwear for a time. All feet were considered equal. In other words, no right or left shoes. This has to have been one of the dumbest fashions of all time. The only dumber decision was the idea to recreate the ridiculous fashion two hundred years later for the sake of authenticity. If the day is cool, I wear a neck kerchief and possibly a cloak. And then I put my hair up in a bun and cover it with a white cap. Again, the more fashionable women in camp may be wearing fancy decorated straw hats or silk bonnets but I hate wearing anything on my head so I usually wear the lightest cap I can find. And if I need to keep the sun or rain out of my face, I wear a man’s plain felt hat over my cap. When they’re not stealing laundry, chopping wood or carrying water, the kids can usually be found at one of the many tents offering goods for sale. Their favorite purchase is maple sugar, and they like to hack it to pieces with a sugar axe before eating it. Again, the use of weaponry undoubtedly figures heavily in the appeal. At the end of the day, I don’t know how close we’ve come, if at all, to recreating the colonial atmosphere we sought. But it’s a great excuse to avoid email for a few days. And it’s one vacation when I don’t mind coming home, because then my ordinary house seems miraculous. Running water! Electric lights! A washing machine! And pizza delivered while we put away the 66 lb canvas tent, baskets full of smoky clothing and the sugar axe. 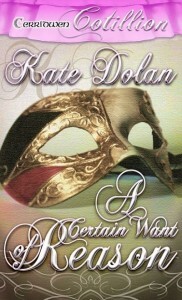 Kate Dolan writes historical fiction and romance under her own name and contemporary mysteries and children’s books under the name K.D. Hays. Her most recent historical release, The Appearance of Impropriety, won the 2010 Written Art Award for humorous fiction. 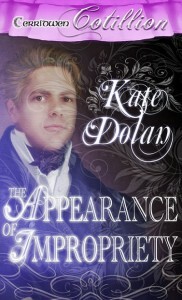 You can learn more about her misadventures with history by visiting www.katedolan.com. That sounds like GREAT fun Kate! My Uncle used to be a Civil War Reinactor. He love it too! Thanks so much for sharing!! I am going over to check out your website! I am definitely living in the correct time! I gotta have the everyday comforts! It can be really relaxing to get away from modern life for a while, but I can't say I mind coming home to those modern conveniences! Wonderful description of a weekend. Sounds like fun, more interesting for the observer than to actually try using the porta potty with 2 pettycoats, just saying. Thanks for sharing. Wow! I don't think I knew this about you. I've always wanted to do something like this but I don't have the time and the closest place is far from us. Thanks for sharing. Best of luck. What a marvelous guest post -- I always wanted to do reenactments -- my wife and I are dipping our toes in locally. I love smelling of wood smoke but will see if I can last multiple days like that! What a terrific post. Sounds fascinating. I still hope to visit you at Fort Frederick soon. I took an open hearth cooking class and can heartily agree that that fabulous Eau De Woodfire scent is strong and stays on long! What fascinating insight into reenactments!! I've always loved history. Maybe I'll take a stab at something like this one day. Great post, Kate! I used to do Civil War reenacting, so much of your description fit what I and my family did on weekends. It was a lot of fun, although I couldn't wait to get home and jump in the shower, especially on those hot summer weekends. Our youngest son was seven or eight when we started and he was good for fetching water for camp and later on, learned how to chop wood for the cooking fire. LOL. By the time we stopped reenacting, he'd become a member of the infantry. An excellent post, thank you. We need more publicity like this. It is fun, no doubt about it. If TEOTWAWKI ever comes, it is people like us that have the best chance of survival. Nothing better to teach survival & have fun at the same time. Thanks for letting me share one of my favorite hobbies! For those of you thinking of trying it, I urge you to at least get out and visit an event for the day. You'll get enticed by it just like I did! Great glimpse into the past. I went to Jamestown with my daughter's class recently, and it was amazing to see how they lived back then. Both the Indian settlement and fort were just fascinating. My idea of roughing it these days is a Motel 6! Go Kate!! I hope I get to see you this year at Frederick. How interesting! I have sometimes wanted to wash my hair at events but never have. Thanks for sharing your experience!